HARTFORD, Conn. (CN) — Following the defeat of his first chief justice pick, who is openly gay, Connecticut Gov. Dannel P. Malloy on Thursday nominated another judge who would be the first African-American to hold the judicial branch’s top job. The nomination of Supreme Court Associate Justice Richard Robinson to chief justice comes after Malloy’s nomination of Supreme Court Justice Andrew McDonald failed to win enough support in the Senate. Unlike McDonald, Robinson was not one of the seven justices to hear the death-penalty case, also known as State v. Santiago. He did however uphold the reversal of the death penalty in State v. Peeler, which was decided one year after the Santiago ruling. Peeler and Santiago were two of the 11 men left on death row when the General Assembly repealed the death penalty in 2012. Malloy said the Republican treatment of judicial independence has caused some to withdraw their name from consideration from the judicial-approval process. It’s unknown how many have removed their names from consideration because the judicial-selection vetting process is secret. Malloy said he’s known Robinson since at least 1984. The two worked in Stamford together, and Malloy was the one who elevated him to the Supreme Court in 2013. Robinson was first appointed to Superior Court in 2000 and was then elevated to the Appellate Court in 2007. Following the defeat of his first nomination, Malloy said he didn’t change anything about how he evaluated the candidates Thursday. “If I did that I would be falling into the trap I’m criticizing other people of falling into,” Malloy said. 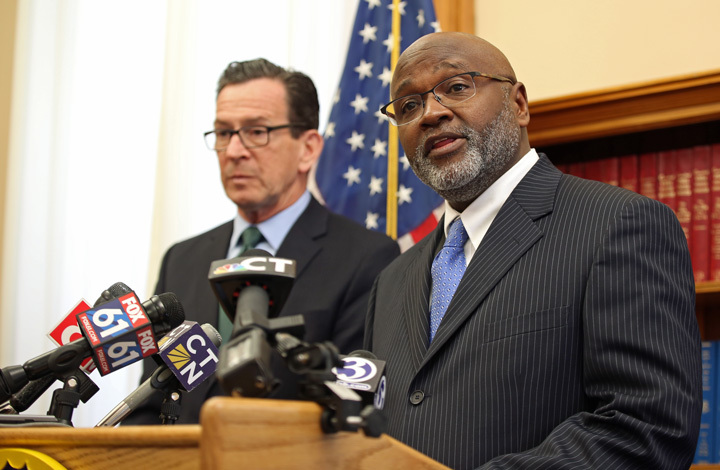 Robinson is the third most senior person on the bench and his confirmation would be another milestone as the first black chief justice in Connecticut. Before serving as a judge, Robinson was president of the NAACP’s Stamford chapter and served as chair of the Commission on Human Rights and Opportunities. Malloy said he’s proud of the diversity he’s brought to the bench over the past seven years. Malloy said he was disturbed about what was said about judicial nominations last night at the Republican gubernatorial debate in New Britain. Judges are renominated every eight years until the mandatory retirement age of 70. Traditionally, governors have renominated judges originally nominated by other governors. Republican candidates for governor said they wouldn’t uphold that tradition and would look at the record of every judge before renominating them. Malloy said Republicans are “seeking to constipate legal thought,” because now justices have to worry about their ability to progress through the system based on the decisions they make. Republican senators said it was McDonald’s decision on the death penalty and a handful of other cases that led to their votes against his confirmation. Senate Republican Leader Len Fasano said that he thinks Robinson would be a good person to lead the Supreme Court. Fasano said, unless there’s something he doesn’t know about, he looks forward to supporting Robinson.